This chromolithograph is taken from plate 15 of William Simpson's 'India: Ancient and Modern'. Indore is in the central state of Madhya Pradesh, and was the capital city of the Maratha Holkar dynasty, which survived from 1733 to 1818. British forces under Sir John Malcolm defeated Rani Krishnabai Holkar's army in 1818, forcing the Rani to sign the Treaty of Mandsaur by which the state of Indore was reconstituted under the protection of the East India Company. 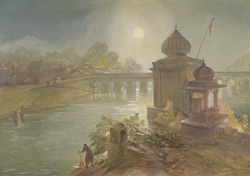 In the 19th century, Indore became an important and lucrative centre of the cotton and opium trades. It was a particularly contested area during the Indian Uprising of 1857.